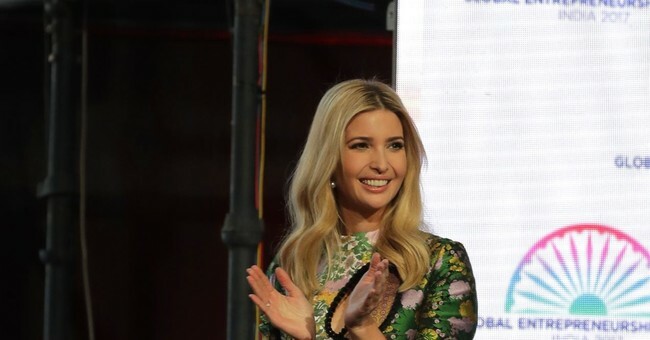 First Daughter Ivanka Trump was in Hyderabad, India this week touting female entrepreneurship. Too bad she wasted the opportunity by plagiarizing much of her remarks from one of her previous speeches, Newsweek declared Wednesday in its piece, "Ivanka Trump Plagiarizes One of Her Own Speeches in India." The Newsweek editors regretted that "the breadth of her talking points were recycled from a previous speech she gave during a foreign trip earlier this month." That other "foreign trip" appears to be the one she made to Tokyo, Japan. They pulled some specific excerpts to prove they had caught Ivanka red handed. "When women work, it creates a unique multiplier effect," Trump said in Hyderabad, citing the same exact line from her Tokyo speech. Her words continued to mirror the speech she gave just a few weeks ago: "Women are more likely than men to hire other women, and to give them access to capital, mentorship and networks. Women are also more likely to reinvest their income back in their families and communities." Politicians and other public figures are apt to recycle their favorite phrases, as Newsweek notes. But, the editors also suggest that Ivanka is repeating herself to promote a new World Bank initiative, which some lawmakers say is unethical. Media pundits were quick to point out that you can't plagiarize your own words. CNN's Jake Tapper was more than happy to share the dictionary definition for Newsweek for future reference. Since the backlash, Newsweek changed its headline and issued a correction explaining that Ivanka had "reused," not plagiarized, an earlier speech.